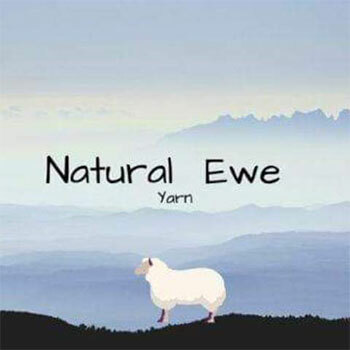 We are a full service, yarn shop catering to knitters and crocheters alike. 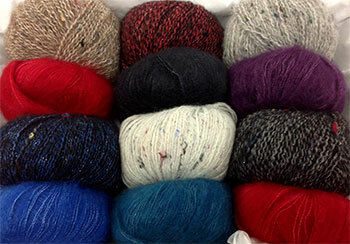 You will enjoy a wide selection of yarns, needles, hooks and accessories in store. Classes are on-going with a complete list offered on this site. Can't wait to see you! The Date is Coming son! ALL WEAVING CLASSES ARE NOW FILLED! Due to the popularity of the weaving classes we have added a 3rd class! It will be on Friday April 12th, in the morning at 10am. About our weaver: We are very pleased to be welcoming Leanne Schmidt back to the Wool & Silk Co in April. She is here visiting us from Nova Scotia and some of you may remember her from Sit & Knits a few years ago. 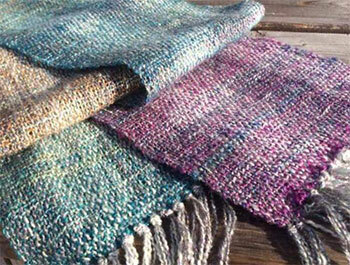 You will be weaving a lightweight scarf using an soft silver metallic warp (prepared by the weaver) and weaving the weft with an alpaca/wool blend. You can view the photo below here for possible colours. Please call or come in to register in advance. Your spot will be reserved by payment of the class fee ($40 cash) which will be separate funds. 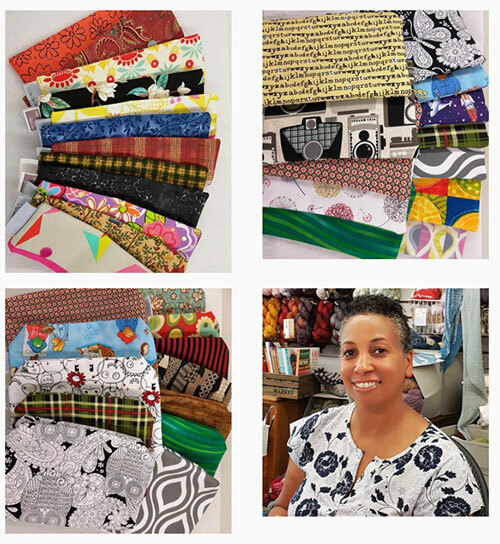 Yarns for this class are additional and to be purchased ahead from Wool & Silk Co.
Andrea Rahmel is visiting us from Bracebridge, Ontario with a trunk show of fabulous yarns. 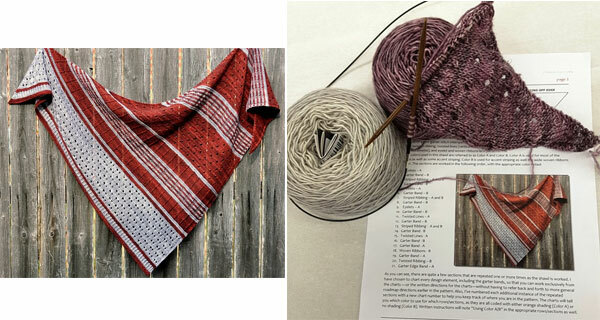 Andrea tells us: I want to share my passion for all things colour and knitting related with eco conscious hobbyists. I believe that each of us doing our own small share in making environmental decisions that lead to sustainable living will greatly improve our planet. The dyes I produce come from my own garden or kitchen, nature in my rural area and sources around the world that promote healthy living. My sources are Canadian Importers with environmentally conscious agendas. Let me help you create naturally beautiful hand crafted items. Last shopping day is March 30th! Spring/Summer classes are ready to go! Please look under the Classes section on our webpage for full listing, dates, times, projects & requirements. 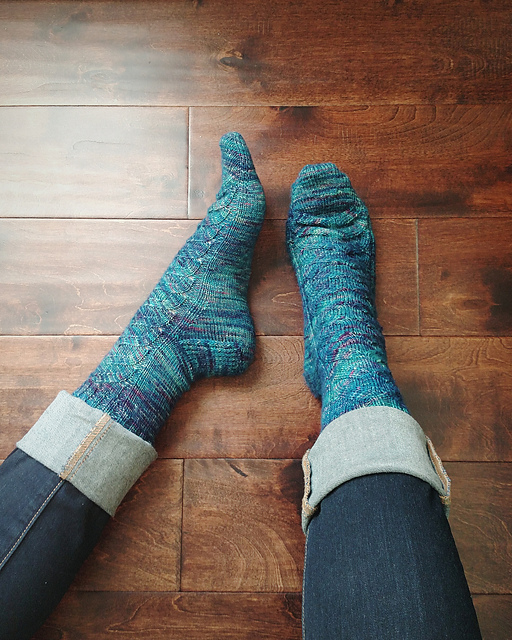 Classes have a set fee & offer 10% off the price of the yarns purchased for the class. 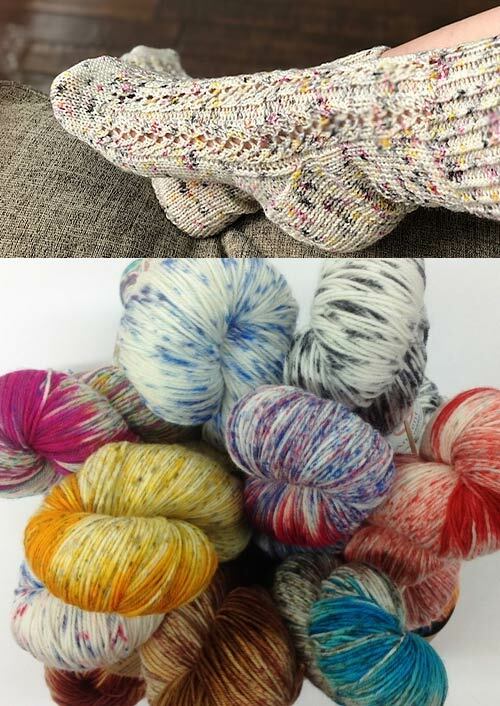 KAL's are free classes but yarns are to be purchased in store and are not at a discount. 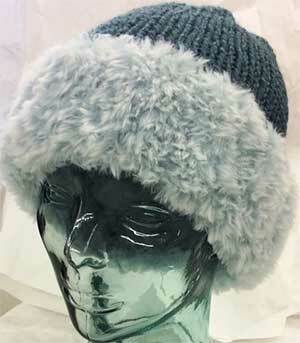 Here is a cozy choice for a winter hat. Faux fur around your face and a soft wool and alpaca blend for the body of the hat. 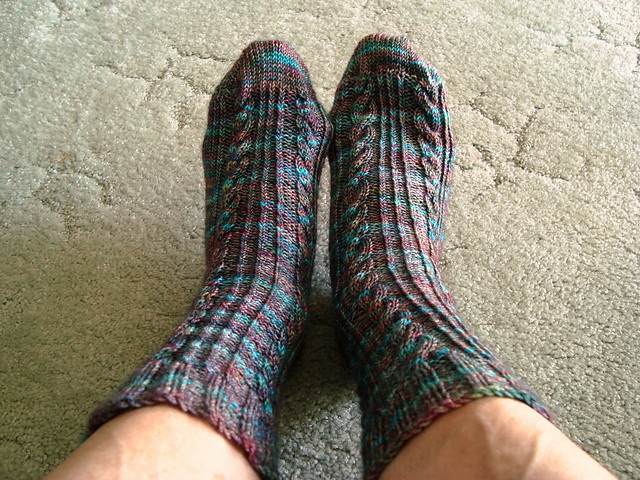 Knitted in two super bulky yarns on 8mm needles, it is also a very quick knit. 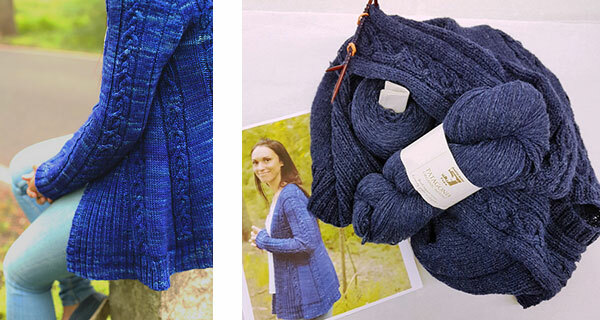 A very easy to wear cardigan with comfortable shoulder lines, fun cables and a flattering subtle A-line in the body. Meant to be worn open. Knitted top down. 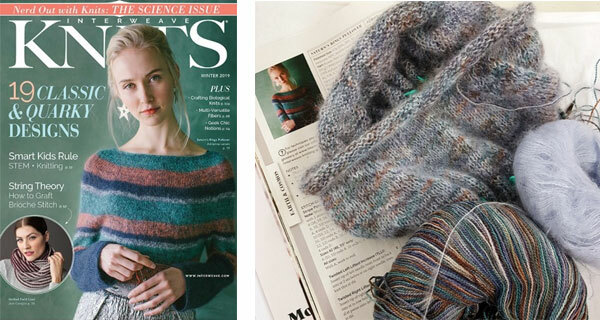 Top-down, seamless, circular-yoke sweater shows how easy it is to achieve stunning results with simple techniques and stripes. This sweater is worked by holding a strand of smooth lace yarn with a fuzzy mohair and silk yarn to create a soft, ethereal, and contemporary look. 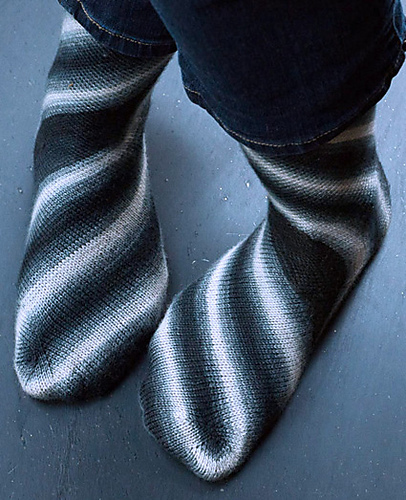 The original pattern calls for a solid lace weight held with varying colours of Kid-Silk to create the stripes. 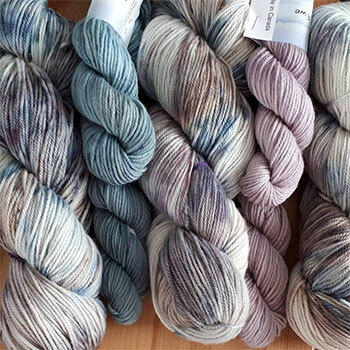 Diane has chosen us to a variegated lace with a single colour of Kid-Silk. Makes for a very soft overall effect. Usonian is a contemporary striped shawl with a striking combination of textured and lace stitch patterns. 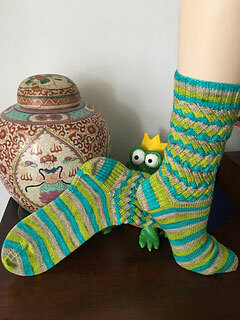 The asymmetrical triangular shaping begins with just a few stitches which then flow into striations of eyelets, garter bands, striped ribbing, twisted stitches on reverse stockinette and a woven ribbons lace border. Knitting this in MadelineTosh Tosh Merino Light. 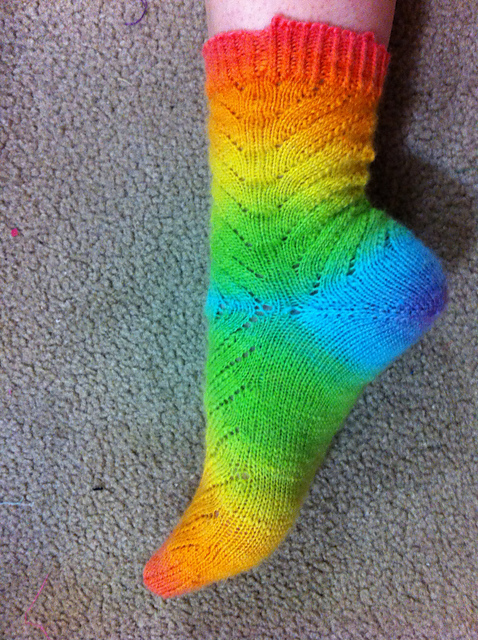 Beautiful yarn. Well written pattern.